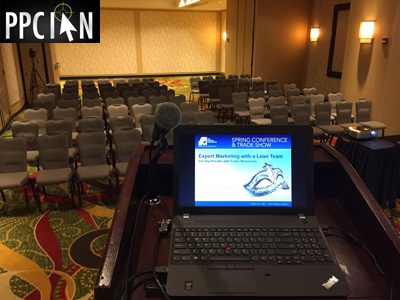 I just had the honor of presenting a session titled Expert Marketing With A Lean Team at the Self Storage Association Spring conference in New Orleans. 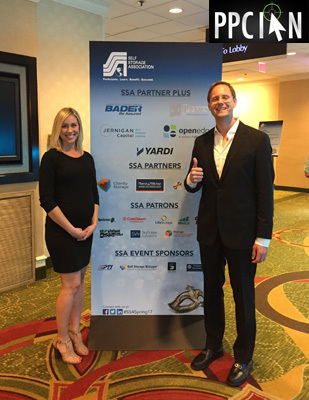 Christine Munther from G5 and I co-presented, and I believe we hit the ball out of the park, driving substantial value and motivation for the audience. I could tell based on the huge attendance (packed room with standing room only) and the incredibly engaged audience (wonderful questions). Today, I want to share the tips that I personally leveraged to put myself in a state of peak performance for our presentation. I hope that you can gain value from these warm up strategies so your next large-audience presentation is your personal best. When I woke up the day of my presentation, I was actually quite tired. It had been a long flight the day before and I didn’t get a ton of sleep due to the time change. That being said, I was able to quickly turn my mindstate into peak performance zone by leveraging my Five Minute Journal. (If you have not checked out my Five Minute Journal Review yet, I highly recommend doing so, as this tool is a game-changer.) The interesting part here is I actually forgot to bring my physical journal, but I was able to recreate The Five Minute Journal (minus the motivational quote) on a piece of blank paper. Importantly, I set forth three goals for the day, only one related to my presentation. The others involved exercising at the gym and successfully completing an investment project I had been working on. I think this point is key: Don’t just focus on your presentation. Focus on you. Make the day exciting beyond your presentation so you don’t get overly focused and anxious about your public speaking. Your best presentations happen when you are relaxed. I’m a big fan of the healthy lifestyle. I try to do something that benefits my health each and every day. I have learned that the mind and body are closely connected. I have also learned the working out can release positive endorphins and put you in a state of peak performance. In the morning, I did some moderate cardio and also some heavy weights (but not for too long). I didn’t want to exhaust myself for my big presentation, but I wanted to do something for me. I wanted to make sure I enjoyed a relaxed state before getting on stage. Christine and I met early and practiced our presentation in the same auditorium of our actual event. I think the location element here is key. Get familiar with your auditorium, if you’re able to get access. Get used to the environment. When we practiced, we purposefully made it more of an informal conversation. We did not go over every single point. We did not use our full voices. It’s important to conserve your energy and leave room for improvisation during the actual event. Save your personal best for the real deal, and go easy and light during the practice run. As a practical matter, we also answered some important questions during our practice run. Would we stand on stage or roam the floor? Would we use the microphone at the podium or use lav mics? It’s great to develop your personal answers to these questions and more during the practice run. Before our big event, I took it relatively easy. I enjoyed the expo hall and some friendly conversations. I had a nice lunch and met some new faces. I left time to just sit and think (mostly thinking through speaking points in my mind). 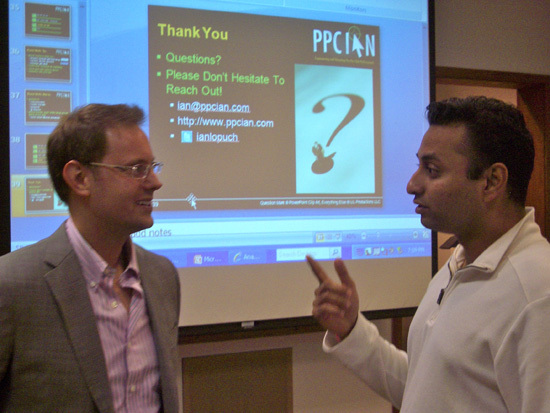 You can go about your day at more of a normal pace after the presentation. Before, it’s important to take it a little light and conserve your energy (especially mental energy). Always remember when going to a conference: You came there to get a job done. All focus needs to be placed towards that goal until it’s successfully accomplished. This tip is an extension of the last one. I often find at these conferences that I lose my voice from so much networking. It’s loud and we all tend to speak in loud voices and with more frequency than normal. Make sure this doesn’t happen on the day of your big presentation. Conserve your voice. You can always power network right after (which is exactly what I did). Public speaking is all about connecting with the audience. It’s all about improvising and telling a personal story. While slides can be helpful, I personally recommend speaking as if there are no slides at all. The point here: Your slides don’t really matter (as much as you think). By the time you have arrived at your conference, no additional changes to your slides are going to help. You’ve already done all you can do on that front. Now is the time to really get in that zone so you can speak from the heart and connect with the audience. The slides are just there to support you. This is a funny one, but I have always found that it’s best to go light and very healthy on days of presentations. You don’t want to have a full stomach when you are about to present. I have found that the body is in peak performance for speaking with a moderate/low amount of food. In fact, I approach this in a similar fashion to sports. I don’t eat a ton of food before an 8-mile run. Rather, I eat that big meal right after. Treat your public speaking like a sporting event. Your inner circle is key. I’m talking about your family and your very close friends. Ask them to wish you good luck. Leverage their words of encouragement to get excited about your event. Be careful here to not involve anyone who could potentially bring any negativity to the matter. Right before your event is to start (about 15 minutes before), start moving from a state of calm to a state of controlled excitement. Now, the sports event is about to start. You’ll want to have all of your energy. You want to be a dynamic speaker that is happy and excited to be there. Don’t go too crazy, but walk around and maybe even do a few pushups. Right before we went on stage (1-2 minutes before), I viewed photos of my amazing family. These photos brought a smile to my face and reminded me that family is more important than anything. These positive photos put my mind at ease and allowed me to transition into one of my personal best presentations. There is so much work that goes into preparing for a great presentation. In order to prepare for our hour-long presentation, we spent countless days building slides and handouts. That work is so important, as it’s the foundation of one’s presentation. At the same time, I believe that the tips mentioned above are the true game-changers. It all comes down to the single moment of one’s presentation and you have to be in the right state. It’s game day and you have to treat it as such. As a bonus tip, I highly recommend a strategy of gratitude as well. There are many wonderful speakers out there with incredible stories to tell. Securing a large public speaking event is a big deal. Once your presentation is over, make sure to thank the conference organizers – verbally, via email, and also with a small gift. Your honor of presenting is due to some really special people who deserve thanks. And, of course, thank the audience too. Their time is incredibly valuable and you should strive to add lasting value in their lives. 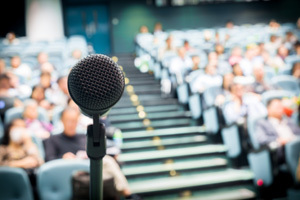 I hope these tips help and wish you all the best in your next public speaking event. I’m a tremendous fan of presenting at digital marketing conferences. In fact, I Recently Spoke at SMX East. Public speaking is such an adrenaline rush, and am amazing way to give back to the digital marketing community. When my good friends at 3Q Digital extended the opportunity to write a guest post for their incredible blog, I just couldn’t resist one about public speaking. 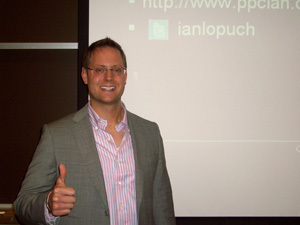 (Especially because their very own Jay Stampfl was on the panel about Advanced Bidding Strategies with me at SMX East.) Make sure to head on over to the 3Q Digital to read my Guide To Presenting At Digital Marketing Conferences. Why Present? I give all the pros of presenting (there are many of them). How To Score Your Speaking Opportunity. These are not easy to get, but a little hard work (and a savvy strategy) will get you there in no time. How To Prepare. The best presentations come from attention to detail in the preparation phase. Thinking about speaking at a digital marketing conference? Don’t know where to start? I hope my guide helps, and hope to see you speaking at the next big industry event! 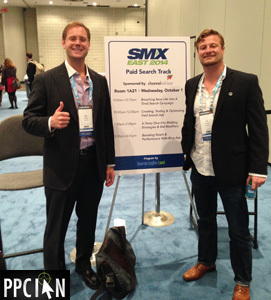 This past week, I spoke about Advanced PPC Bidding Strategies at SMX East, New York. It was so much fun. Today, I wanted to share my experience and some cool pictures. 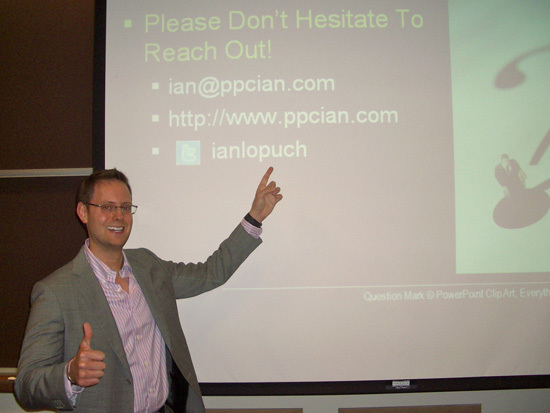 If you’ve been reading PPC Ian for a while, you probably know that I’m a huge fan of public speaking. Earlier this year, for example, I enjoyed being the Keynote Speaker At A Big YPO Event. When this SMX East opportunity presented itself, I just had to make it happen! It’s all about networking with the best and brightest in the industry. It’s all about giving back and Associating With Great People. Network in the right way (build real friendships and help others), and these great opportunities have a way of presenting themselves! I’m truly thankful for my friends in the industry who made this opportunity a reality. 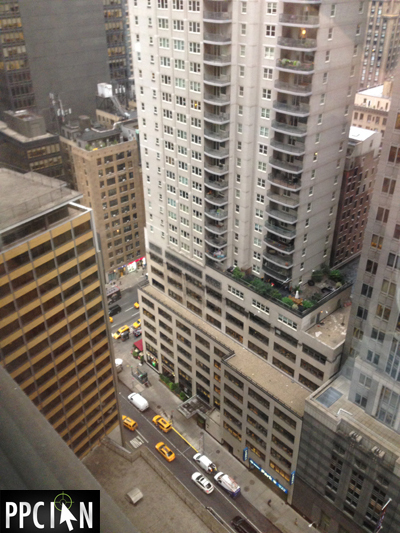 The highlight of my trip to New York was speaking at SMX East. When it comes to public speaking, it’s all about preparation. I actually prepared my presentation a few months ago. 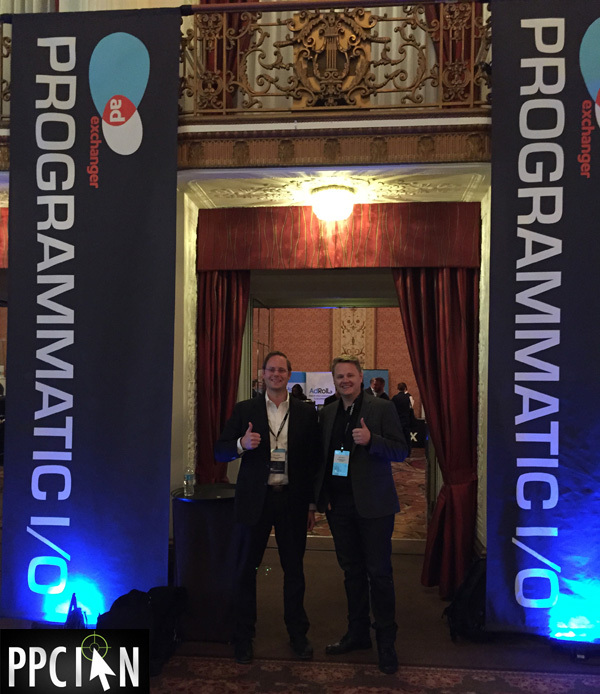 To commemorate my 10-plus years in the industry, I decided to present 10 lessons learned on advanced PPC bidding strategies (actually there was an 11th tip too, a bonus one). While my presentation was prepared months ago, it’s all about adding value far above-and-beyond the words printed on the slides. As such, I spent a good amount of time the days leading up to my presentation practicing, writing down notes, and finalizing my presentation. I found that this last minute prep work truly adds value and makes for a stellar presentation. And, it went flawlessly. I was part of an exciting panel with two other leaders in digital marketing: Jay Stampfl from 3Q Digital and Lauryan Feijen from iProspect. 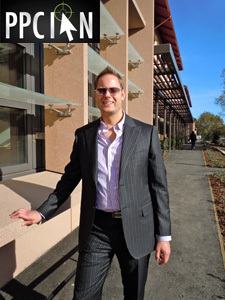 Our panel was moderated by Brad Geddes, another leader in digital marketing. I really enjoy panels because they offer the presenter the opportunity to collaborate and form great friendships. Also, they offer the audience a variety of different viewpoints on the same topic, which is always cool. All three of our presentations were really great, and the questions from the audience kept coming. Really fun times! 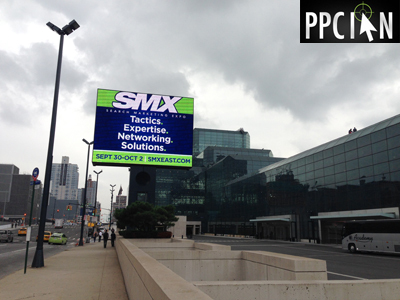 Aside from the speaking, the overall SMX East conference and New York experience was amazing. 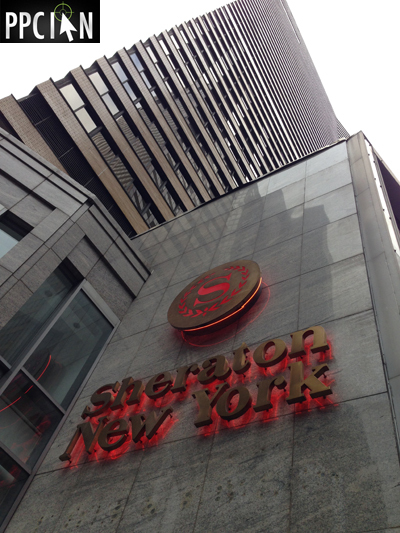 I stayed at the Sheraton New York Times Square. They treated me like a king. 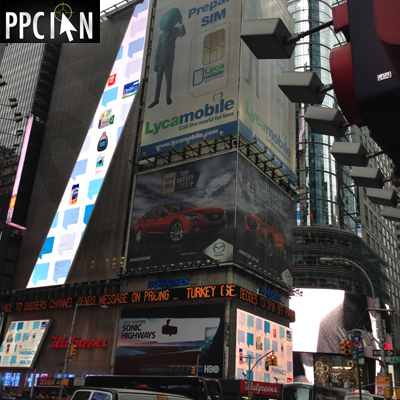 Times Square itself was really cool. I enjoyed meeting up with several friends during my trip, including Leo Polanowski (Head of Clients Services, Americas at Yahoo!) and Robby (one of my old friends, a veteran in our indsutry). 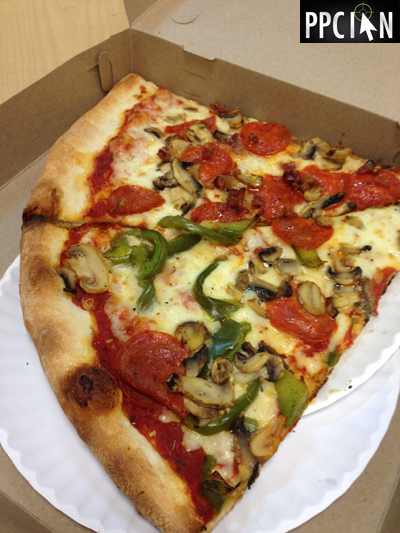 I found the food in New York truly delicious, especially the the pizza. The weather was stellar (70s), and the week couldn’t have gone better. I left energized and excited about our industry! I also left feeling truly thankful that I have a boss and employer who supported me through the entire process. 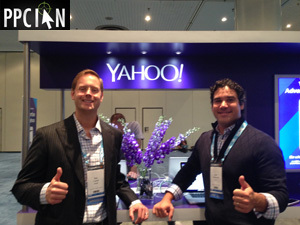 Thanks, SMX East, for the great opportunity and fun times! Happy holidays, everyone! It’s around this time of year (with the new year quickly approaching) that I’m always thinking of great, new ideas to improve all areas of my life: my career, my personal life, and of course my blog. Just last week, I posted a video about Brainstorming For 2014. Well, the other week while brainstorming, my wife suggested a new idea called “Backyard Blogging”. 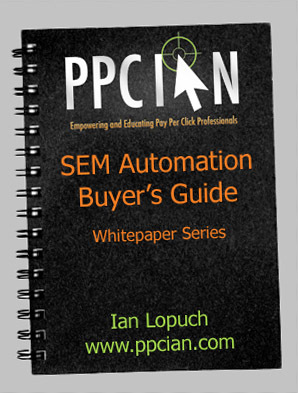 This would be a fun video blog series that I would do each week (or as often as possible) here on PPC Ian. It would be a great way to keep it fun and casual, and shoot informative videos without much/any need for fancy editing. The end result: This becomes a new and exciting way to connect with others in digital marketing / customer acquisition (you), and keeps things super fun here on PPC Ian. Also, it’s a fun way for me to practice my own presentation and speaking skills (something I’m truly passionate about). Well, I’m thrilled today to share my first episode of Backyard Blogging. Please check it out below, and make sure to subscribe to my YouTube channel. Playing into the theme above, I thought the first topic should be all about public speaking and presentation skills for businesspeople. In the exciting world of marketing and customer acquisition, there are always opportunities to present, oftentimes to large audiences. Superb presentation skills create a world of opportunity in one’s career. Thanks for watching and wishing you an amazing 2014! 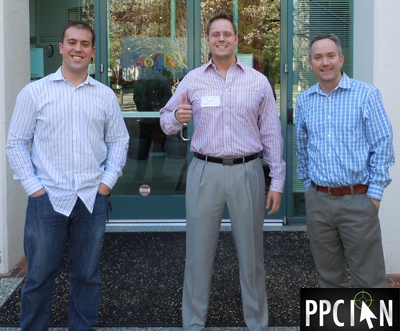 Recently, an amazing opportunity presented itself: I had the incredible honor of speaking to the Google AdWords Product Marketing team. It was a truly amazing experience, one of my favorite speaking opportunities. Formatted as a pure Q&A format, the Google team asked some truly great questions. I particularly enjoyed sharing my large, enterprise-level AdWords experience with Google, and hope my presentation helped spark some ideas in Google’s product marketing roadmap. I also enjoyed staying after the presentation and forming friendships. It truly is all about your network and friendships, that’s how this unique opportunity presented itself. Matt and Google, I truly appreciate the opportunity, please let me know if I can ever be of assistance! 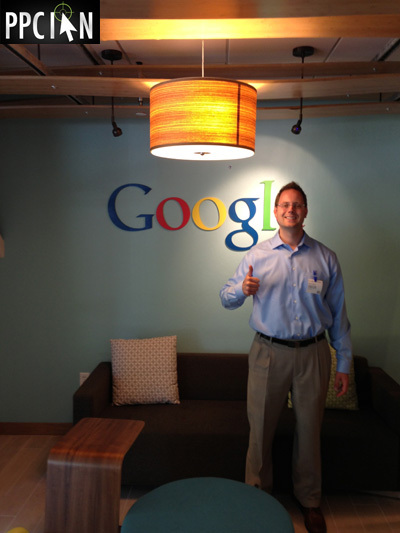 I’m really excited right now because I spoke at Google today. It was quite the honor and my second time speaking at Google (I spoke on a panel back in 2009 at Google’s Client Ad Forum). Today, I spoke for one hour to a group of 20 Google employees across marketing and product management, an event called Client Connect. I want to sincerely thank James and the Google marketing team for arranging this event, it was a true honor in my career. My presentation today spanned one hour, and that hour flew right by! 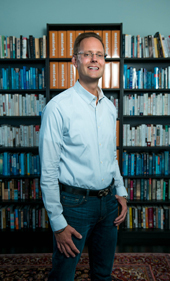 I focused on industry trends, predictions for the future of digital marketing, and opportunities for both advertisers and Google. Throughout my presentation, I had the great opportunity to interact with amazing Google employees and field some seriously great questions! While I’m not able to share the presentation here (it’s confidential to my employer), I wanted to write a quick post to call this out as a major advantage of the corporate SEM career path. 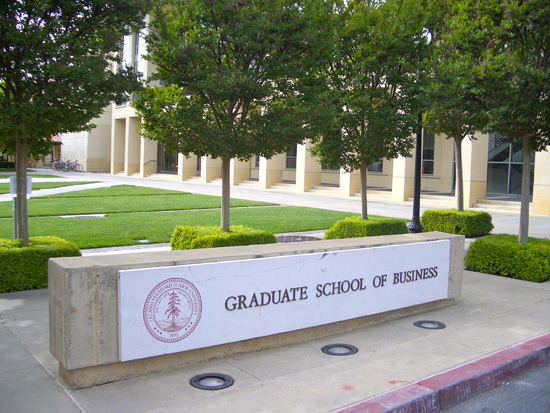 Just in the last year, I spoke at Stanford Graduate School of Business in May, I spoke at Stanford Graduate School of Business in January, and now I spoke at Google. If you’re into public speaking and giving back to the industry (I sure am), search engine marketing is an amazing career path to consider. It’s because of the corporate SEM career path that these speaking events presented themselves. I wanted to close out by calling attention to Google. I couldn’t be more impressed. My account management team (Ryan and Rich in the picture above with me) in addition to all the attendees to my presentation are truly top notch. 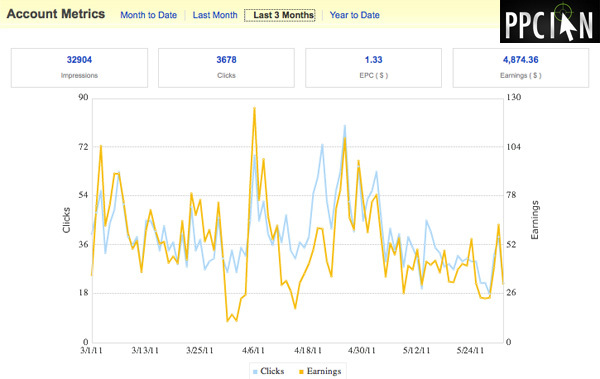 Google is innovating so quickly and I really can’t get enough of it. 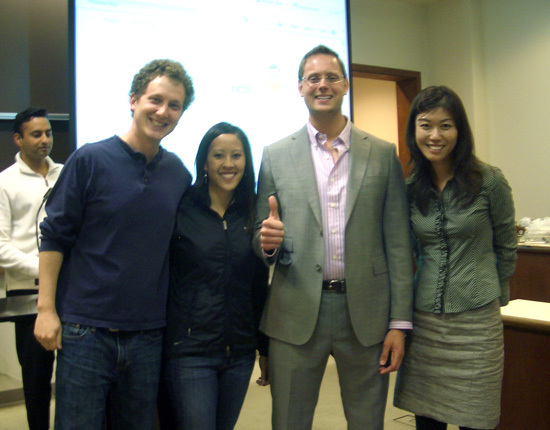 They’re one of the best partners ever and it’s a true pleasure working with the Google Financial Services team. I’m looking forward to my next public speaking opportunity for sure.